A short biography of Margaret Greville, one of the greatest society hostesses of the early 20th century. She rose from obscure origins to become one of the wealthiest heiresses in Britain. Mrs Greville was relentless in her pursuit of the wealthy and powerful people of her age. Among her friends, she could count King Edward VII, Queen Mary, and King George VI and his wife Elizabeth, to whom she bequeathed her marvelous collection of jewels. Mrs Ronnie (short for Ronald, her husband’s name) loved to entertain lavishly and her hospitality was legendary. However, her fascination for power and charisma also led her to champion the likes of Hitler and Oswald Mosley, which she later regretted. Although ambitious, Mrs Ronnie also had a big heart. She was very loved by her servants and she made sure that, after her death, they were all well-provided for. She also did many charitable deeds. Mrs Greville never had children, so, when she died, Polesden Lacey, her magnificent country house where she had entertained her circle of friends and powerful acquaintances was left to the country and can still be visited today. Sian paints an accurate and fair portrait of this astonishing lady, pointing out her flaws, but also praising her good qualities. 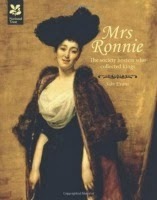 In addition, the author does a marvelous job at making the world in which Mrs Ronnie lived come to life again. It wasn’t an easy task, as Mrs Greville’s Head Steward had destroyed all her personal papers after her death, as his mistress had requested him to do. Overall, it’s a very enjoyable and informative read that I highly recommend. World War I reshaped Europe. It destroyed empires, and set the stage for everything that happened in the 20th century: Fascism, Communism, Nazism, World War II, mechanized warfare, the Cold War… We’re told it was sparked by the assassination of Archduke Franz Ferdinand by Serbian nationalist Gavrilo Princip, but that’s too simplistic an explanation. So, what was it that brought a peaceful and prosperous Europe to utter and complete ruin, savagery and war, leaving millions of people dead? Was it the system of alliances then in place? The navy and arms race? Nationalism? A bunch of war-mongering officials in the right (or wrong) places? A combination of all these factors? Why did the war break out? Margaret MacMillan, in The War That Ended Peace: The Road To 1914, accurately and minutely describes all the steps that fatefully lead to the outbreak of the war, whose germs had already been planted decades before. The author doesn’t offer any new theory or interpretation of events, but simply tells the story of Europe before the war, explaining how every decision that was made left rulers with always less and less alternatives until, finally, a war became inevitable. MacMillian, though, seems to believe that the disaster could be avoided, but fails to explains why or offer alternatives. Despite this, this is a well-documented and extremely-detailed study of the years that led to World War I, a war that no one wanted and yet no one was able to prevent. The book is extremely interesting, but also very long and features so many characters and events that can it can feel overwhelming at times. Yet, it is written in a clear style and provides some interesting insights that will provoke debate. Overall, this is a great book for everyone who wants to know how and why the war that ended peace began. A biography of one of the most significant political figures of the 20th century, written by her adviser and speech-writer Robin Harris. Harris undoubtedly admires Margaret Thatcher, but he still manages to remain objective enough to paint a fair portrait of her, warts and all. She defends her policies, but also points out, and criticizes, her mistakes. Harris clearly tells you from the start that he didn’t write the book to describe what Margaret Thatcher was like, but to explain her views, her vision and what she was trying to achieve. He also examines the consequences of her reforms. Therefore, the book focuses mostly on her political life. Not For Turning doesn’t follow a strict chronological order. Instead, each chapter deals with a particular event or political issue that Mrs Thatcher faced during her time. This makes it easier for the reader to grasp the problems of the time and the way Thatcher faced them. However, some of these problems, in particular the economic ones, are more complicated, and therefore more difficult to follow, than others. That makes the book dry, but still interesting, in places. Although her personal life takes a backseat, Harris still provides fascinating anecdotes and insights into it. Her struggle to juggle her work with her family life, the influence her father had on her upbringing, her weight problems are all mentioned and help us better understand the woman behind the politician. Harris also discusses her last years, and her health decline, in a dignified and sympathetic manner. Overall, Not For Turning is a must-read for all those interested in Margaret Thatcher. Informative and captivating, it helps the reader to better understand one of most controversial and longest-reigning Prime Minister of the past century, and her legacy, which is still affecting British politics today. Disclaimer: I received these book in exchange for my honest opinion. In addition, this post contains affiliate links.